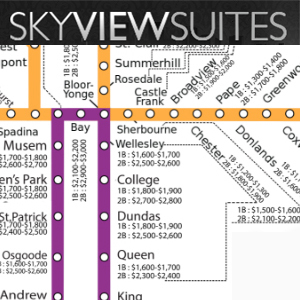 Toronto’s Sky View Suites has produced maps showing the average condo rents and house prices near each of the city’s subway stations, and it’s apparent that bargains are hard to come by along the transit line. Sky View Suites co-owner Steve Argyris cited a 16.4-per cent increase in Toronto housing prices from June 2015 to June 2016 and attributed part of it to increased foreign ownership and what he referred to as “the Manhattanization” of the city. “We’re not New York City but we’re starting to have more of a global presence. If you take a look at other large global cities, the price per square foot in Toronto is still a deal. Sky View Suites’ most recent map shows the average cost of a three-plus-bedroom house in Toronto, or three-bedroom condos in the downtown core where low-rise detached or semi-detached housing is rare. It showed that houses around the York Mills subway station were the most expensive in the city at $3.55 million — even when removing the highest and lowest priced properties in case outliers unfairly skewed the data. That area includes the exclusive Bridle Path, Post Road and Park Lane Circle and explains why its prices were so much more than its nearest competitors and was the only subway stop to top $3 million. Prices exceeded $2 million around the North York Center, Davisville, St. Clair, Summerhill, Rosedale, Bloor-Yonge, Castle Frank, Bay and St. Clair West stations. The least expensive housing downtown was around Wellesley at $856,000 and, farther out, $653,000 around Victoria Park in Scarborough. Cost differentials weren’t as large for one- and two-bedroom condo rentals. Bay station was the only one where rents for one-bedroom units topped $2,000 per month and it was the only area where the average rent for two-bedroom suites touched $3,000. The lowest rents were in the east end around Woodbine, Main and Victoria Park stations. Argyris believes that the rents that can be obtained for three-bedroom homes or condos haven’t risen as quickly as the purchase prices for those houses and that “the rent ratio to sales price ratio gap is starting to widen.” However, a Sky View Suites report said that buying and renting out condos still offers an attractive return on investment despite higher purchase prices. Sky View Suites offers companies and individuals furnished apartments, short-term rentals, corporate housing, serviced apartments and extended stay housing in Toronto that suit the needs of travelers for business, vacation, immigration or relocation. It also works with investors to rent out newly purchased and furnished condo suites for a three- to five-year period. While Argyris’ company deals with furnished condos, he said that the market for unfurnished apartments in purpose-built rental buildings in Toronto is growing. Sky View Suites are primarily located in Toronto’s downtown core, with some units in North York. “Our clients are primarily corporate and they want to be within walking distance of their work and enjoy the amenities that the city has to offer,” said Argyris.